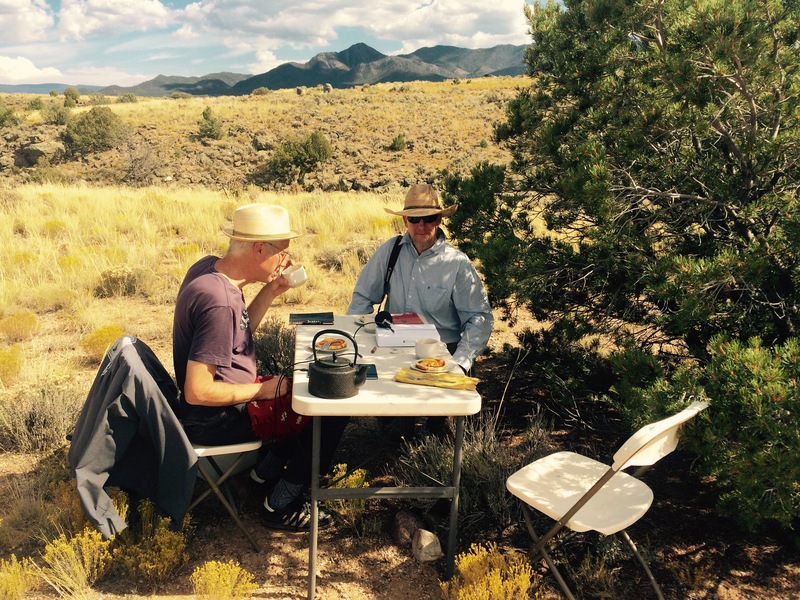 For our first Art+Tea session, we had Earl Gray tea and peach tarts with Taos-based artist/activist Scott Moore. Scott is the Director of the Beautiful Midden project. A midden is a term for a refuse pile or dump. The project stages artistic interventions aiming to inspire dialogue around the widespread practice of illegal dumping into Northern New Mexico’s fragile waterways. David and I were really curious about how the project uses art for social and cultural change. 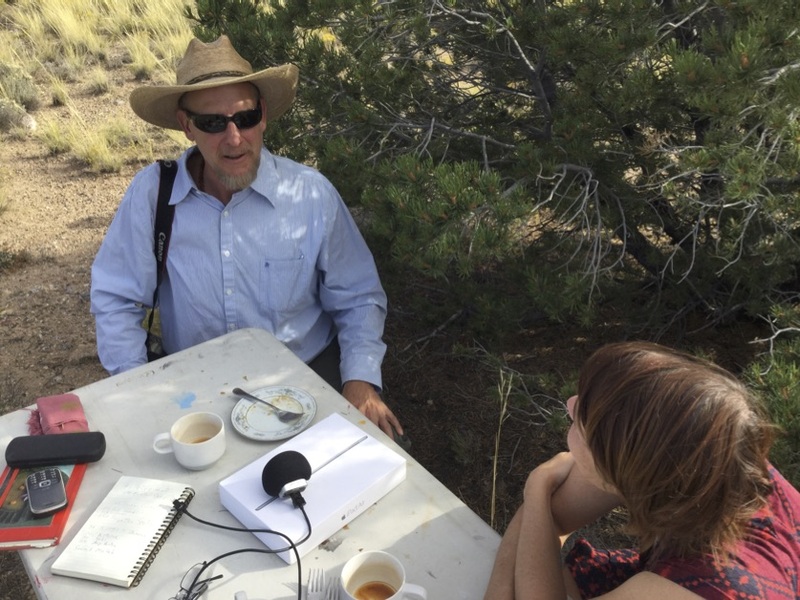 For our discussion, Scott drove us out to the original Beautiful Midden site on the stunningly gorgeous mesa overlooking the confluence of the Rio Grande and Rio Pueblo de Taos rivers in Taos County. You’ll hear Scott talk about art, activism and community including stories about Scott playing sousaphone with the NYC based Hungry March Band. The illegal dumping of trash and firing of lead based ammunitions into arroyos, rivers and riparian zones has been a problem throughout Taos County, New Mexico for many years. One site of intensely concentrated dumping is located at the end of County Road 110 south of Taos, near the confluence of Rio Pueblo de Taos and the Rio Grande. Many of the dumped materials are physical hazards potentially leading to entrapment of wildlife in addition to being toxic pollutants. The original Beautiful Midden site from the top of the canyon, the midden or dump is below where garbage–cars, refrigerators, etc.– has been pushed off the rim of the gorge. David and Scott set up for the Art+Tea conversation at the original Beautiful Midden project interventions. Working directly with Amigos Bravos, a state-wide organization to protect and restore the waterways of New Mexico, the Beautiful Midden project functions as an empowerment vehicle for the community of Taos to examine the health, economic, and environmental impacts of intense dumping and shooting practices near waterways and rivers .”Four Days” is a sculpture designed to harvest lead commenting on ammunition’s adverse impact on vital water sources. The sculpture was under fire and blown to pieces in the four days of its installation. The sculpture harvested lead-based ammunitions that would otherwise have been dispersed into the environment, providing evidence of the need for a safe and legal shooting range in Taos County. Scott has been an artist drawn to community activism through performance and music for many years. 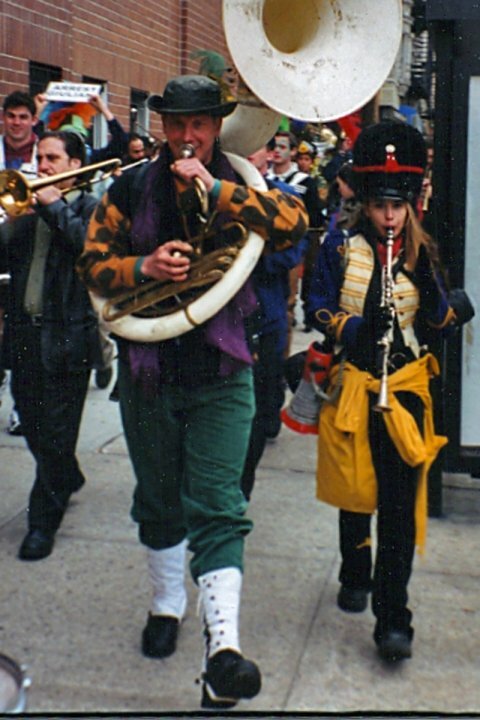 This photo shows Scott on Sousaphone in the late 1990’s NYC community art, music, carnivalesque party & activism scene with the Hungry March Band. Photo from Ellen Flynn. 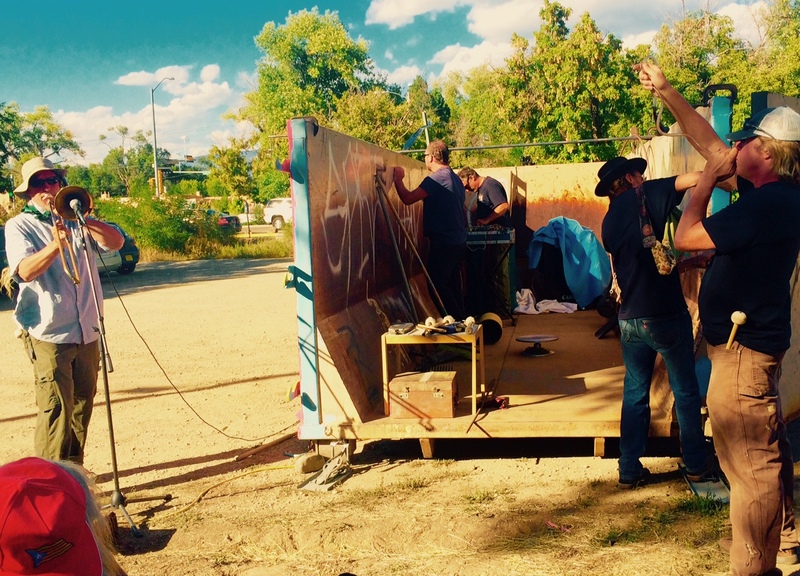 Dumpster musical performance at the Taos Center for the Arts in conjunction with The Beautiful Midden exhibition, Summer 2015. How to Throw a Tea-Party at the BEAUTIFUL MIDDEN! The cantankerous conundrum of paradise: I mean, IF it IS all God’s Green Earth, where do we dump that old Toyota truck that is definitely NOT worth fixing? Where did Adam & Eve throw their beat-up blenders & disposable diapers? The Tigris or the Euphrates? MIDDEN is an archeologists’ word for a trash site. Doesn’t sound so bad, does it? In the 80’s when I moved to Taos we would find ravines full of rusty cars & rusty cans & blue-glass bottles: excellent fodder all for budding young artists, a gold-mine, even, in some inverted, DIY kind-of way. Times have changed, though, & that cool-looking, rusty Model-T is now buried under nasty green Gremlins, broken TV sets, rotting stuffed-animals & 5 gallon paint cans shot full of holes leaking ugly white paint. The dump is no longer a pretty sight. For more on how to make ART out of nasty trash such as the above, go to our wonderful conversation with Taos-based artist, Scott Moore. This is the RECIPE section, remember? Even the most depressing political situations & earth-killing degradations require the thinking-man & thinking-woman to take a well-deserved tea-break; a human tradition that knows no cultural or religious boundaries, thank God! For our “Tea at the Beautiful Midden” our respite would require nothing less than Earl Grey Tea (custom made by Taos’s own: Tea-O-Graphy) & Peach Tarts with Lime Caramel. Scott and Liz having the Art+Plus tea conversation at the Beautiful Midden site. 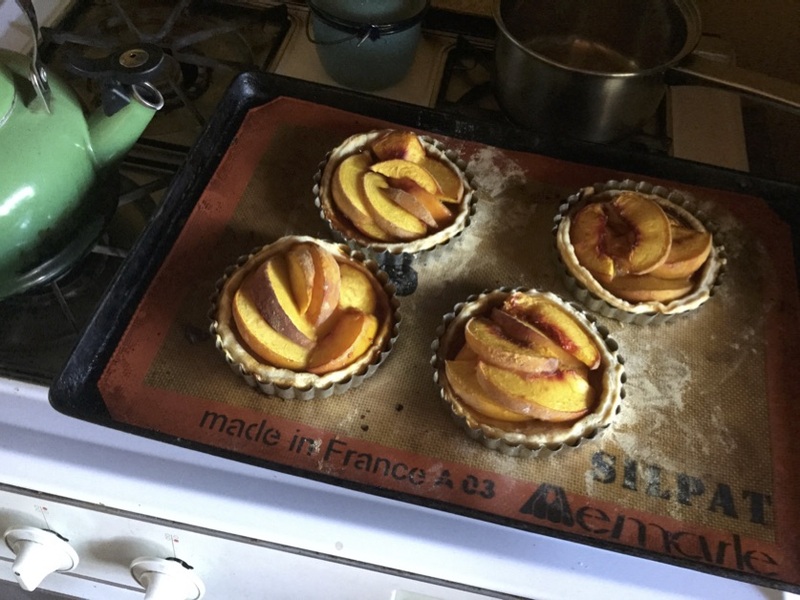 It was just about the end of peach season, but peaches were on my mind, so I bought a big bag of them & figured I could bust out some basic peach tarts, no problem. One bite into a peach, though & I was thinking, “these peaches are not nearly as good as they were last week!” Ouch! What to do? Luckily, I had some lime caramel left over from, who–knows–when? that just “needed to go!” (Caramel lasts, practically forever, right? worst case scenario there‘s a little mold on top & you scrape it off, right? ?…is this acceptable talk for a recipe? I don‘t know, make your own judgements bakers!) Anyway, I knew this lime–caramel would sweeten things up along with adding a little bit of tang. (Not the stuff the astronauts drink, BTW). The dough: super–basic, no sugar added! Good to have on hand at all times, (does NOT last forever, though! not even close, a couple weeks tops). It can EASILY rock a treat sweet or savory so it is extra handy to have in the fridge. This is straight from the Tartine cookbook which I highly recommend. Add the salt to the water, stir & put it in the freezer while you continue. Cut the butter into 1 TBS sized–chunks & toss with the flour. I zap this in my food processor until the butter is pea–sized or smaller. Add the water & salt mixture & combine. Do this by hand & do not over–mix, flakiness is at stake here! Personally, I prefer the dough on the dry side, because after it chills in the fridge the dough will put on a little moisture. Again, the dry side is the flaky side, & flakiness is what matters, right? Put the ball of dough in a plastic bag & place in the fridge. IF you don‘t have a food processor I suggest you google ‘how to cut butter into dough with a pair of knives,’ or better yet, ask your grandma! After at least 2 hours or overnight you can roll out the dough & make the tarts. I cut about 1/4 of the ‘ball of dough‘ off & rolled that out to about 1/8″ thick. I cut the rolled-out dough with a 6″ round dough-cutter, but you can use a little plate & trace around it with a knife. You could just ‘eye-ball’ it, too & cut a circle approx. 6″ if you’re good at that sort of thing. These are rustic little tarts, so they don’t have to be perfect. 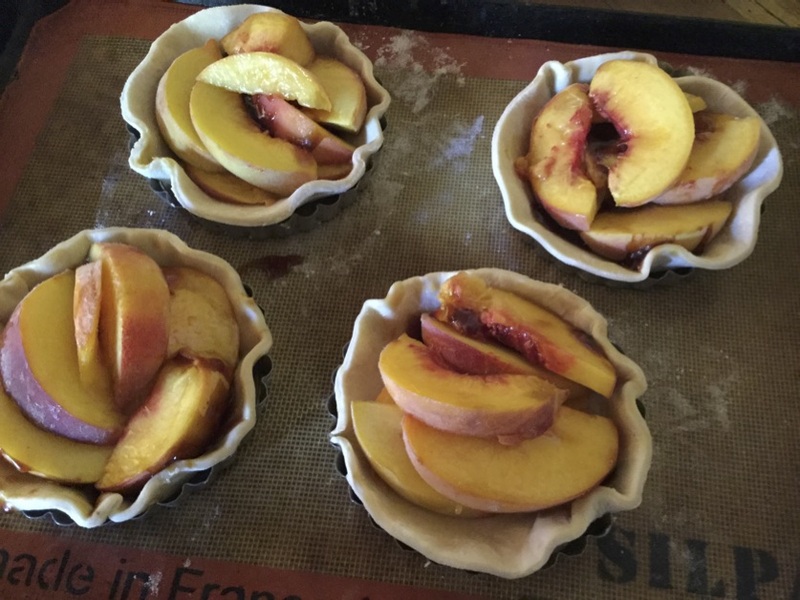 I sliced up a whole peach for each tart. Like I said, I decided my peaches weren’t sweet enough so I drizzled lime-caramel over them, 3 TBS, to be exact, (recipe below). You could just sauté the peaches briefly in butter & sugar & then place in the shells, but I am getting away from my little recipe here. I baked these at 375˚ for 20 minutes, rotated the pan & then cooked for 20 minutes more. For the caramel I juiced 4 limes & put that in a little pan & warmed it up. At the same time I took 3/4 cup sugar & melted it at medium heat in a cast–iron pan. Any pan with a thick bottom will do. It is best to be patient with this. If you have NO experience melting sugar & making caramel I suggest you google that, too & watch a video. you don‘t want to get burned, or burn your house down. When ALL of the sugar is melted, which I capitalized because IF it isn’t ALL melted at this point you will end up with chunks of solidified sugar that will NOT go away after the lime juice is added. You want the lime juice at simmer, almost a boil because you don’t want to cool the sugar down. NOW, you pour the lime juice into the completely melted, but not burning sugar, this boils up big, so have a large enough pan for the expansion here, turn the heat down to almost off, & let the bubbling, boiling liquid settle down. Then stir together gently, add 1 TBS butter & pour the caramel into a little container. You can keep this in the fridge & warm up on the stove any time you want to use it. So now, after you’ve eaten your Peach Tarts with Lime caramel, you should have tart dough & caramel left over to add to your next dessert adventure.